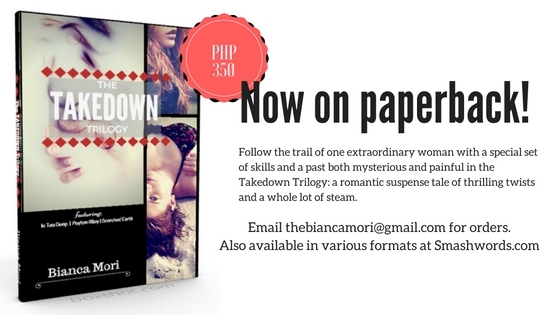 The Takedown Trilogy blog tour happens today August 15 - 21. You can win a signed copy of the paperback - the very first time all three takedown books are available in print - just by joining the blog tour raffle. Join below! I really don't watch suspense movie because I'm a scaredy cat. So I have no favorite suspense movie. Haha. Anyway, I'd like to ask what inspired you in writing this book? And among the books in this trilogy, what book did you have a hard time writing? Hi Alyssa! Thanks for your comment! I love suspense movies / thrillers and heists, but I also love romance. And I always thought that these suspense movies would be so cool if they had a deep element of romance. :) Even better if the movie hero was actually a woman! And that's what inspired me to create that own story. Which kinda reminds me of Pokemon Go since almost all are on their phones except no one is doing a dare and no one is watching the other besides asking what pokemon the found. HAHA!